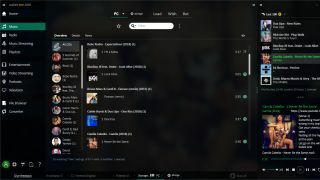 Audials has released the 2019 edition of media streaming and recording software Audials One, with a new search engine for finding music on Spotify, an improved YouTube downloader with 4K support, and a new TV player. There are so many different services streaming music, TV shows and movies, it can be a hassle keeping track of them all. Audials One brings them all together in one convenient place. Audials One also lets you record music. Enter the name of the track you want, and the software will watch out for it being streamed on an online radio station. Recording live broadcasts for personal use is legal in most countries, though it's a good idea to check the rules where you live. Audials One 2019 features a new tabbed interface (our only real complaint with last year's version was its somewhat cluttered design), making it easier to navigate the software's huge feature set. We'll be taking the new release for a spin and publishing our thoughts very soon. What's the best music streaming service for you?